You try to open 4D Client as usual but you get the error -10002. This is one of the most common problems with 4D Client. This error occurs when 4D Server is not running. When you see this error, it means that 4D client cannot connect to 4D Server. Make Sure 4D Server is running. For more information on how to restart 4D Server refer to the next section Restarting 4D Server. Once you are sure that 4D Server is running, run 4D Client once again. Click on the middle tab TCP/IP and wait for a few second. After a while you should see CurrencyXchanger appear under Servers. Once you see CurrencyXchanger appear, double click on it, or simply select it and click OK. 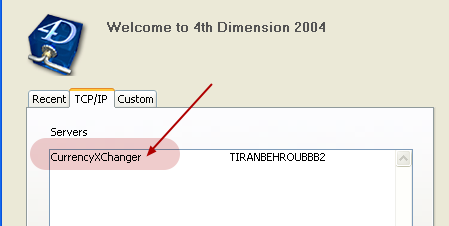 If CurrencXchanger does not appear after 30 seconds, then your 4D server may not be running. Once again, make sure you follow the instruction on how to restart 4D Server. If you are 100% sure 4D Server is running and 4D Client cannot detect it under the TCP/IP tab, then make sure that your network connection is working. You can check that by trying accessing the Internet. Sometimes Windows firewall configuration may interfere with 4D Client; you may want to ask an IT personel to check that. Double click CurrencyXchanger or highlight CurrencyXchanger and click OK.
Prev: Error: License is expired! Manual backup from the server. How to restore a backup file from 4D Server? How to restore a backup file from 4D Runtime (standalone users)? Error: No more room to save the record! How to restart 4D Server? Error: Cash Account is not valid! How to Request Support in CurrencyXchanger?